A Must have for GM's that have a computer at their side. 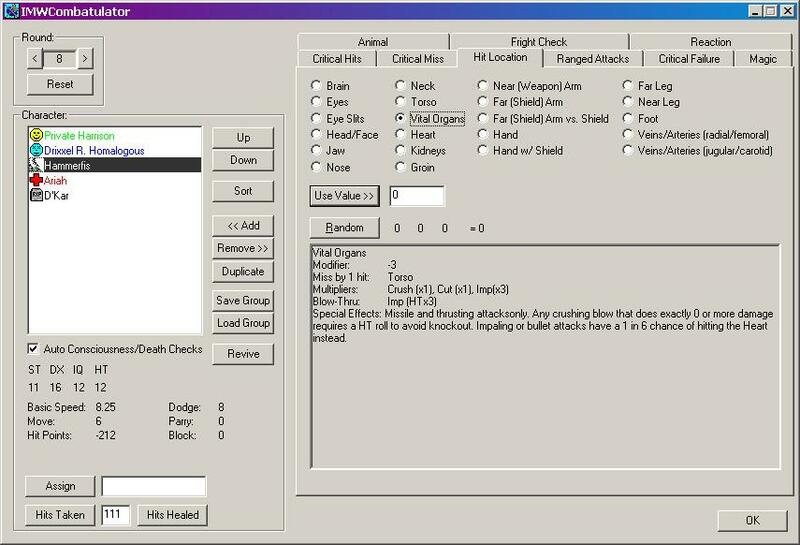 Integrated Character files from Imaginware's GURPS character generator. Save character party groups for easy loading later. Sort by character's combat move, then by basic speed, so you will know who always goes first every round! Many, many tables at your fingertips. No longer will you search for that fright check table in the middle of fighting that dragon!! Have the combatulator perform automatic death and consciousness checks for NPC characters. Including beginning of round consciousness checks. Assign PC's to other combatants and no longer lose track of who is fighting who.